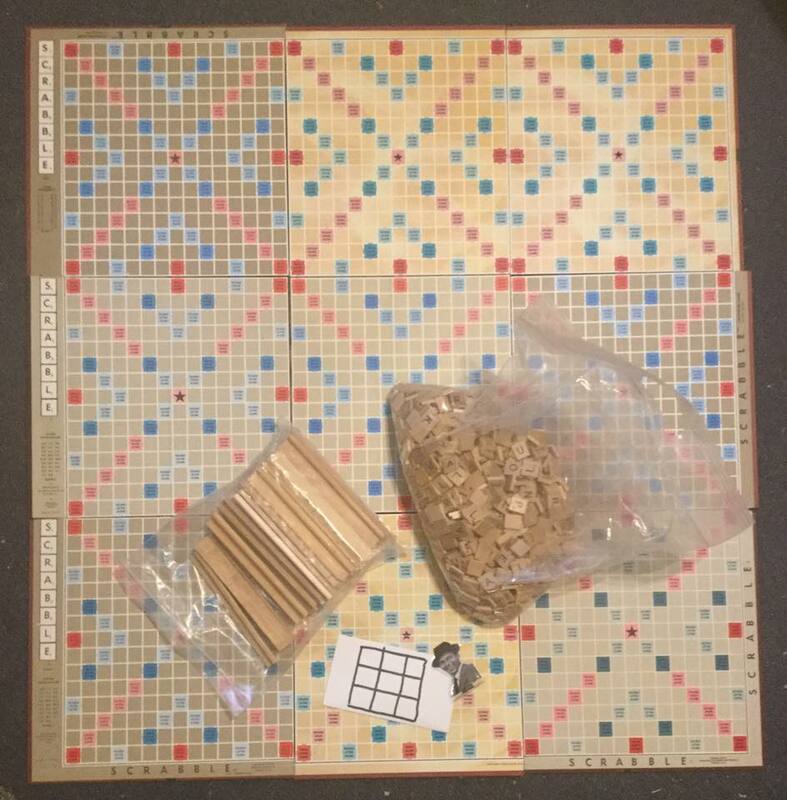 I started buying old Scrabble board game sets from garage sales, and actually physically cut (gasp!) these boards so that their edges would line of suitably to each other, leaving the borders only on the exterior of the 3×3 grid, and then mixed all of the tiles together, and collected the racks, etc. You need to be familiar with the/your traditional Scrabble rules first, although many of those rules are suspended for this version (such as scoring). 1. Players each draw (via the standard Scrabble method of selection) 15 tiles for the making of words. Letters may be visible or hidden from other players at the individual player’s discretion. 2. The first nine plays must be played across one of the 9 center stars of each board (and no certain order for which star). Each play is recorded on a separate tally sheet of which word is played, but only scored as 1 for each word (irrespective of the tile value). Only the single word play is counted; for example if POORLY is played horizontally, and EDITED is played horizontally with the first E below the Y (to form YE going down) only EDITED is scored as the 1 for that play. 3. After the 9th play, players may choose whichever board they wish to play a word off of in traditional Scrabble connection style and their words documented as before. The person who makes a word that connects on board to another becomes the Frank, and the “Frank” figurine (which I made of a picture of Frank Sinatra) is placed before them to indicate their status, and the first two connected boards become the main cluster. If desired, another tally with a tic-tac-toe shape drawing is kept indicating which boards are connected, as a quick reference. If someone else makes a word connection between a board and the main cluster, that person now becomes the Frank and is granted ownership of the figure and title. 4. When the final move is played which connects all boards into a single 9-board cluster, the title of ‘Final Frank’ is awarded to that player. The list of which words were played, the date of the game, the names of the players in that match, which player was the Final Frank, and how many words total were played, is kept with the game set in storage between games (and optionally, a photo/drawing of the final layout of the match) for future glory. Subsequent attempts at this game seek to connect all 9 boards in fewer total words played, but, must be played with the same number of players as before. The title of Final Frank may be upset by a tie on total word scores, as being the most recent Final Frank on that game set. An example of a tally sheet and game in progress is as follows (but arrange however you wish)..
Was a 13-year-old Mexican Boy Given 20 Years For Defending His Mother? Doubtful. Here’s Why. On June 16, 2017, a change.org petition was created to advocate for the reduced sentence for a boy who supposedly used his father’s gun to shoot someone he believed was assaulting his mother, in her self defense. According to the petition, the boy received “20 years” in prison for his heroism. However, the petition and thereby tweet uses the photograph of a kid from a different story. The kid in the photo was actually from a “Bronx bully” story by this NY Daily News article. The petition’s source article is in Spanish, but a google search for the photo of the dead assailant from the petition’s source is actually from yet another article reported by this Red-Accion.mx article about someone named Iván Salgado Quintín, who was killed during a bar robbery. A search for Spanish keywords about the story, brings up this TVNotas.com.mx story, which doesn’t cite any sources and has more ads than sentences. This Provincia.com.mx article also comes up, but both of these only suggest the sentencing will happen in the future, not that it has happened. This English-translated article seems to be written by a writer named La Polvorita, possibly “Jessica Sanchez” who also uses the same Bronx boy and dead bar thief as images. This Veobook article, and this Mundo Y Salud article repeat the same basic story, although the latter gives a few more details, but still continues to republish the same fake images. If such a self-defense shooting did actually occur, and a 13-year old was actually sentenced, then story isn’t very well researched or documented, since it uses 2 different photographs pulled from 2 unrelated articles, perhaps using the cover of Spanish-language translation to thwart fact-checkers. No Mexican officials are listed as announcing results, no national-media journalist articles, no broadcast media articles, no particular court listed, etc. While I would say it’s entirely possible this /might/ have happened, every reference that I can find to the reporting of it doesn’t really meet genuine journalistic standards and seem to be entirely from gossip sites. Signing the petition wouldn’t do any harm, necessarily, and if true, could do some good if effective toward a real story which I can’t confirm to suit my personal authenticity/fact-checking standards. Did Bernie Sanders Impose a Religious Test? NO. Here’s Why. Making the rounds is a video about Bernie Sanders, who attempts to apply a line of questioning to a nominee for a government position. Bernie’s question involves whether the nominee’s writing of the Christian concept of a final judgment, is “Islamophobic” and many sites are reporting the line of questioning as a “religion test” as if Bernie is demanding the nominee renounce his faith. I am a Christian, and I believe there will, at some point in the future, be a throne-judgment of the peoples of the world to separate those who have trusted in Christ’s merit on their behalf rather than their own merit, differentiated from those who insist on their own merit or another non-Christ’s merit for worthiness. However, I do NOT believe Sanders was imposing any kind of religious test, NOR requiring the nominee to renounce his faith — but rather was posing a religion-related which sought to be preventative of persecution, to ensure the nominee’s equal application of the law once in authority. Bernie’s question isn’t unconstitutional, but addresses whether the nominee’s application of the law could become unconstitutional because of his faith. Imagine if you had the opportunity to add a credible voice of your approval or disapproval, of someone who would take office, who might use their faith as a scapegoat for applying the law unfairly to certain groups that their religion frowned upon — before they were able to take office and abuse their authority. This is what Bernie’s line of questioning seeks to establish to me. He’s not imposing a test to see whether the nominee will renounce his faith — it has nothing to do with whether he entrusts his own worth to Christ’s worth, but whether his belief about the members of Islam will be an excuse to unfairly treat members of Islam once he had gained office. Bernie, to me, is asking essentially, “would you use this idea, of the condemnation of a certain type of person, as a basis to apply the law unequally or unfairly to members of that group, using your faith as an excuse?” The need to find out whether the nominee is making an Islamophobic statement is necessary, to ensure equal protection of all citizens, constitutionally, and to ensure the nominee will not abuse the authority granted to him, using his belief of condemnation as scapegoat. I think the nominee answers to the question Bernie is asking, and also tries to point out that Bernie’s reference to the statement is out of context and attempting to re-assert its original context, but I think ultimately Bernie’s line of questioning is appropriate. I disagree with Bernie’s final remark, because the nominee did assure the equal respect of all persons but Bernie seemed to fail to realize it. It was a tense moment, and I think it could have been handled better by both people, but it’s difficult to form the words on the spot and under such pressure. Is The MSM Distracting The Public From Other News? No. Here’s Why. Is the mainstream media (MSM) conspiring to distract the attention of the public from other more important topics? No, it isn’t, and here’s why you’re an idiot if you think so: your knowledge of the event does not affect the event. You are not Superman, and therefore do not need to know immediately when something happens so that you may swoop in and affect it, in a way that matters one event to another. If you know about one news item sooner than another, those news items still transpire the same, with or without your knowledge of them. Is there some shadowy cabal of news agencies bent on trying to distract you from one enormous government scandal, with constant updates about some missing airliner? No, Tom Clancy, there isn’t. That would just be you, making excuses, for your own failure to realize that (a) you have direct control over which news items you personally encounter, and (b) your knowledge of any given news item matters approximately zero to the outcome or fallout of that news item. Imagine two individuals: Person 1, a little girl playing with her teddy bears at home; Person 2, some plumber listening to an AM-radio host yammering endlessly about the mainstream media’s failure to disclose x-y-z details about a top government official’s ties to another country. Both individuals are not focused on some school shooting or whatever, happening at that very moment. Whether either individual is aware of the school shooting, does not affect the school shooting. The level of impact, for both individuals about the school shooting, toward the school shooting, is the same. The ability for Person 1 to voice her opinions about Justin Bieber to her teddy bears gathered for a tea party, and the ability for Person 2 to post their official emoji reaction on Facebook to any given news item, impacts the news items the same amount. There is no reason for a shadowy cabal of news agencies to conspire to divert the attention of your nation’s viewership away from a given topic, because the nation’s viewership of it impacts that news topic approximately zero, if not absolutely zero. Because it’s not like, you can’t look it up a few hours later, or maybe the next day, the next week, year, or decade. The timeliness of your response to knowledge of a particular news event is unimportant, because you are not part of it. You are not needing to know it, because you do not affect it. Also, you, yourself, uniquely control what access to which news articles you personally consume. You possess that ability to change channels. You are not tied to a chair with your head in a restrictive clamp being subjected to specifically one news agency. Your own distraction from any given story is arguably your own fault. Who was it that tuned into that station? Who was it that didn’t walk out of the room, or picked up that specific newspaper? Was this shadow-media telekinetically making your face scowl at the burning of a church in Atlanta, so you would be distracted from the white officer shooting a black handicapped man in LA? Or was this same shadow-media mind controlling you to view the officer shooting instead of the burning church? Your inability to realize you cannot possibly perceive all media outlets simultaneously, nor all processes of all editing rooms spacing/timing decisions, is on you. Your child’s preoccupation with whether he placed in Diamond or Platinum on competitive matches in Overwatch when he should instead be studying for the spelling bee, is the same level of his own fault, as is yours toward having viewed one news agency’s offerings from another. Overwatch isn’t to blame for distracting him from the spelling bee, as much as one agency’s coverage of topic A isn’t to blame for your own having-been-unaware of another agency’s coverage of topic B, or neither’s coverage of topic C.
You are to blame for your own knowledge of any given news item. You don’t affect it anyway, so there’s no inherent need for you to know it one second sooner or one second later, either. Click your heels together, people who blame the mainstream media for distraction; you’ve had the power to direct your own attention to one topic or another, this whole time — not that you could affect the outcomes of either meaningfully to begin with.